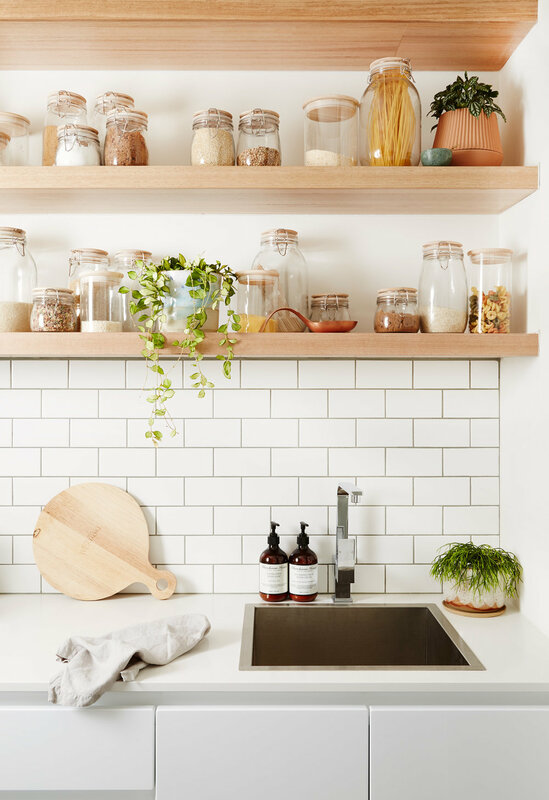 A young family worked with Michelle Hart of Bask Interiors to inject warmth and personality into their Melbourne home. The result – a beautifully textured interior that’s hard-wearing enough to withstand the toddler factor. 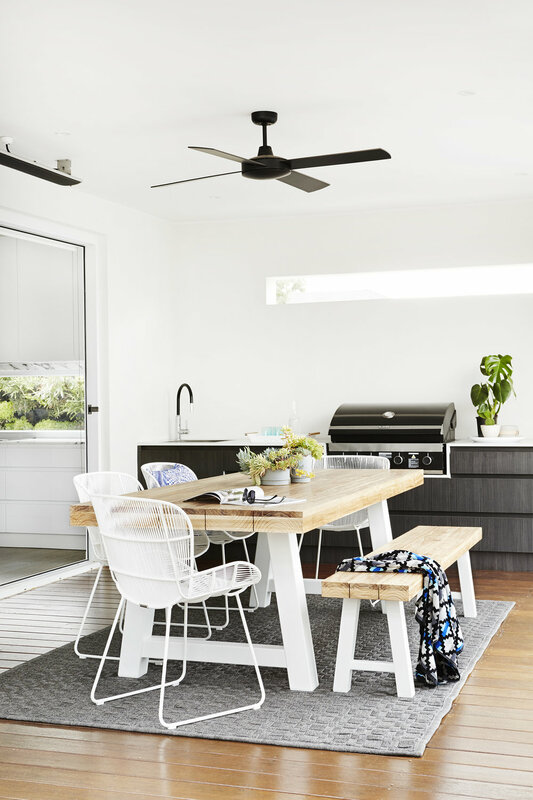 For Berivan Dubier, her husband, Shawn, and their two small children, moving from a Federation-style home to a freshly renovated, 1950s house in Melbourne’s Black Rock presented a challenge – how to furnish it. Their new place was ideal for a family, but lacked warmth. “It was basically a white blank canvas,” Berivan explains. 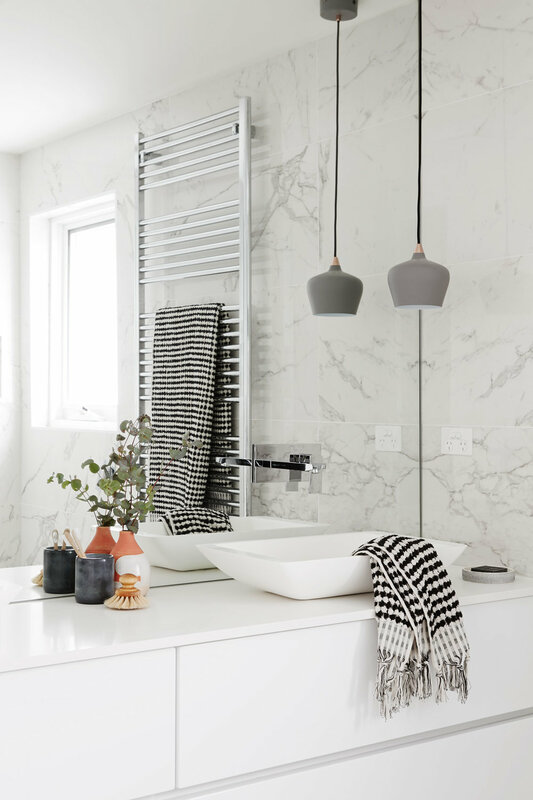 Local interior stylist Michelle Hart was enlisted with a clear brief – make the home inviting, but keep it practical for a family with young children. The more traditional decor from their previous home didn’t suit their new space, so they opted to keep only a few artworks and two beloved silk rugs. In the living room, a palette of navy, light grey and white, warmed with blush accents and tan leather, keeps the space soft but grounded. “I didn't want our living zone looking too feminine, as my husband would feel out of place,” Berivan explains. 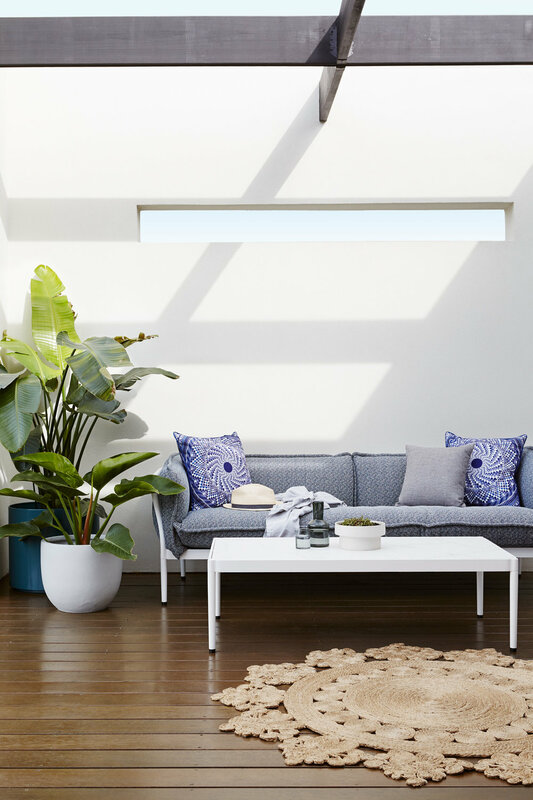 The room is anchored by a neutral Wilfred linen sofa and armchair, and a navy Andy armchair (all by Jardan), atop a woven rug from Halcyon Lake. 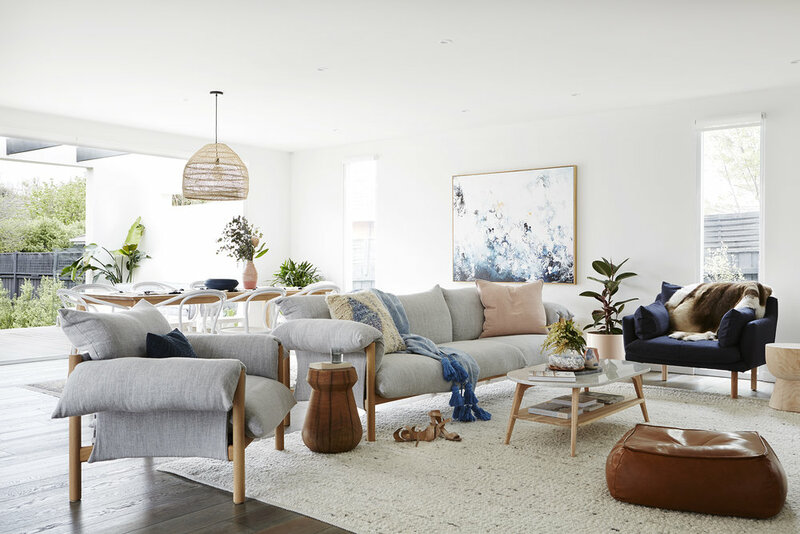 Michelle mixed materials – a marble-topped Fenton & Fenton coffee table, timber Mark Tuckey side table, tan leather ottoman from Jardan, soft cushions and throws, and living greenery – to create a laidback, textured look. The living room is part of an open-plan dining room and kitchen. Though it’s a large space, Michelle says it was also the most challenging, as two long, thin windows along one wall interfered with the placement of a sideboard – “it ended up being halfway in the living room and halfway in the dining room, looking like it didn’t belong to either”. To solve the problem, she commissioned a large artwork by Australian artist Michael Bond, to unify the two zones. She then dispensed the sideboard and instead installed a Fenton & Fenton bench with a woven leather top. Michelle styled the master bedroom as a restful retreat for tired parents. She lightened the space by switching the bedside lampshades from black to a white-and-oak combo, and installing a custom-made bedhead upholstered in light grey fabric from MuBu Home. A photographic work – At Peace by Aussie photographer Joanne Piechota – adds another layer of tranquility. “I didn’t want our living zone looking too feminine, as my husband would feel out of place,” Berivan explains. The home’s casual style flows out into its alfresco space, which is furnished with unfussy layerings of white, blue, and timber. Berivan chose to install lush, self-watering, vertical gardens (by PAPS Vertical Gardens) outside the kitchen window – and as a showstopping backdrop to the pool. Want to see this home in print? You’ll find the full home tour in our Autumn 2018 edition, available through our online shop. Click here to buy.